Cities: Capital: Banjul (pop. 34,828 excluding suburbs; 2003 census provisional). Nationality: Noun and adjective — Gambian(s). Annual population growth rate (2009 est. ): 1.668%. Ethnic groups (2003 census): Mandinka 42%, Fula 18%, Wolof 16%, Jola 10%, Sarahule 9%, others 5%. Education: Years compulsory: up to age eight. Attendance — 69% primary, 35% secondary. Adult literacy — 40.1%. Health: Life expectancy (2009): 56 years. Infant mortality rate — 67/1,000. Subdivisions: Capital and six regions. Political parties: Alliance for Patriotic Reorientation and Construction (APRC), United Democratic Party (UDP), National Reconciliation Party (NRP), National Convention Party (NCP), Peoples Democratic Organization for Independence and Socialism (PDOIS), National Democratic Action Movement (NDAM), Gambia Party for Democracy and Progress (GPDP), National Alliance for Democracy and Development (NADD), People's Progressive Party (PPP), and Gambia Moral Congress (GMC). Annual growth rate (2010): 5.5% to 6%. Gross national income per capita (2009): $517 (Atlas method); $1,330 (purchasing power parity). Inflation rate (consumer prices in 2010): 6%. Services (59% of GDP and 6% of labor force): tourism, foreign banking. Agriculture (24% of GDP and 75% of labor force): Products — rice, millet, sorghum, peanuts, corn, sesame, fish, palm kernels, vegetables, livestock, forestry. Industry (12% of GDP and 19% of labor force): Types — peanut and fish products, construction, telecommunications, brewing, soft drinks, agricultural machinery assembly, woodworking, metal working, clothing and textile manufacturing, food processing. Trade: (2009 est. ): Principal exports: $94.8 million: groundnut products, fish and fish preparations, cotton lint, palm kernels, re-exports. Major markets — India 42.2%, France 15.2%, China 7.3%, U.K. 9.0%, Hong Kong 4.5%, U.S. 0.9%. Principal imports — $280.3 million including food and beverages, manufactures, fuel, machinery and transport equipment, minerals. Major suppliers — China 21.1%, Senegal 12.4%, Cote d'Ivoire 4.8%, Brazil 6%, Netherlands 4.8%, U.S. 3.3%. FY 2010 U.S. bilateral assistance: $120,000 in International Military Education and Training. Currency: Dalasi (GMD). 28.6 GMD = U.S. $1 (2010). 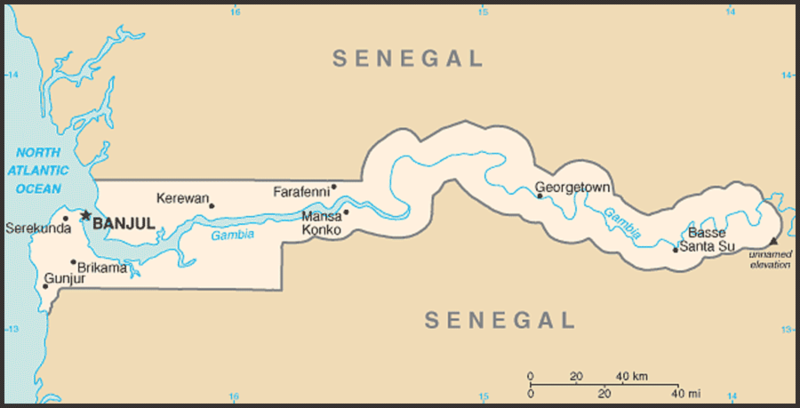 The Gambia was once part of the Mali and Kaabu Empires. The first written accounts of the region come from records of Arab traders in the 9th and 10th centuries A.D. Arab traders established the trans-Saharan trade route for slaves, gold, and ivory. In the 15th century, the Portuguese took over this trade using maritime routes. At that time, The Gambia was part of the Kingdom of Mali. As many as 3 million slaves may have been taken from the region during the 3 centuries that the transatlantic slave trade operated. It is not known how many slaves were taken by Arab traders prior to and simultaneous with the transatlantic slave trade. Most of those taken were sold to Europeans by other Africans; some were prisoners of intertribal wars; some were sold because of unpaid debts, while others were kidnapped. Slaves were initially sent to Europe to work as servants until the market for labor expanded in the West Indies and North America in the 18th century. In 1807, slave trading was abolished throughout the British Empire, and the British tried unsuccessfully to end the slave traffic in The Gambia. They established the military post of Bathurst (now Banjul) in 1816. In the ensuing years, Banjul was at times under the jurisdiction of the British governor general in Sierra Leone. In 1888, The Gambia became a separate colonial entity. In late 2001 and early 2002, The Gambia completed a full cycle of presidential, legislative, and local elections, which foreign observers deemed free, fair, and transparent, albeit with some shortcomings. President Yahya Jammeh, who was re-elected, took the oath of office again on December 21, 2001. The APRC maintained its strong majority in the National Assembly, particularly after the main opposition United Democratic Party (UDP) boycotted the legislative elections. President Jammeh was re-elected for a third 5-year term on September 22, 2006 with 67% of the vote. The UDP received 27% of the vote, and instead of boycotting future elections, vowed to take part in the 2007 National Assembly elections. 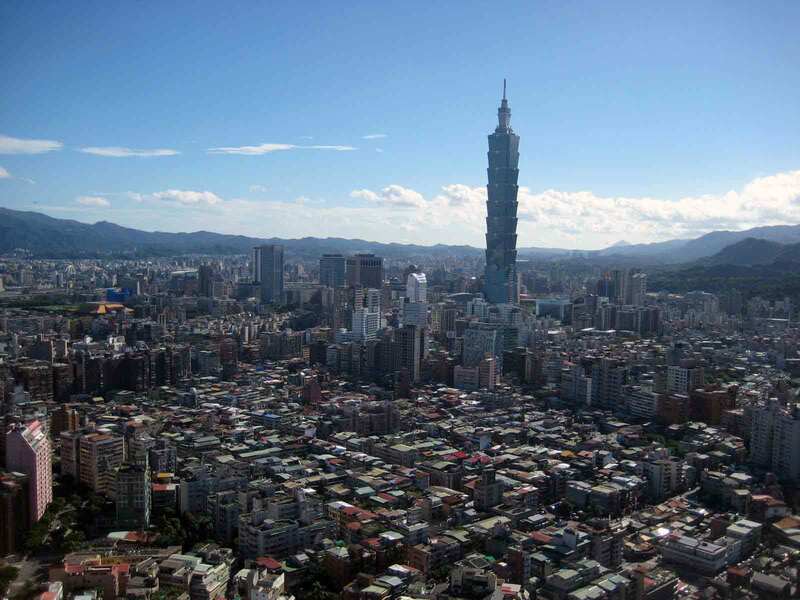 In the January 2007 parliamentary elections the ruling Alliance for Patriotic Reorientation and Construction (APRC) won 42 of the available 48 elected seats. Local government in The Gambia varies. The capital city, Banjul, and the much larger Kanifing Municipality have elected town and municipal councils. Five rural regions exist, each with a council containing a majority of elected members. Each council has its own treasury and is responsible for local government services. Tribal chiefs retain traditional powers authorized by customary law in some instances. The Gambia maintains an embassy at 2233 Wisconsin Avenue, NW, Suite 240, Washington, DC 20007. Tel. (202) 785-1399. Its UN mission is located at 820 2nd Avenue, Suite 900-C, New York, NY 10017. Tel. (212) 949-6640. The Gambia Armed Forces is about 5,000 strong. The army consists of infantry battalions, Republican National Guard (which comprises the State Guard, Special Forces, and the Guards Battalion), and the navy, all under the authority of the Ministry of Defense. Prior to the 1994 coup, the Gambian army received technical assistance and training from the United States, United Kingdom, People's Republic of China, Nigeria, and Turkey. With the withdrawal of most of this aid, the army received renewed assistance from Turkey and new assistance from Libya and others. The Gambia allowed its military training arrangement with Libya to expire in 2002. However, military assistance from the U.S. has resumed and is steadily growing across the spectrum of Gambian security. 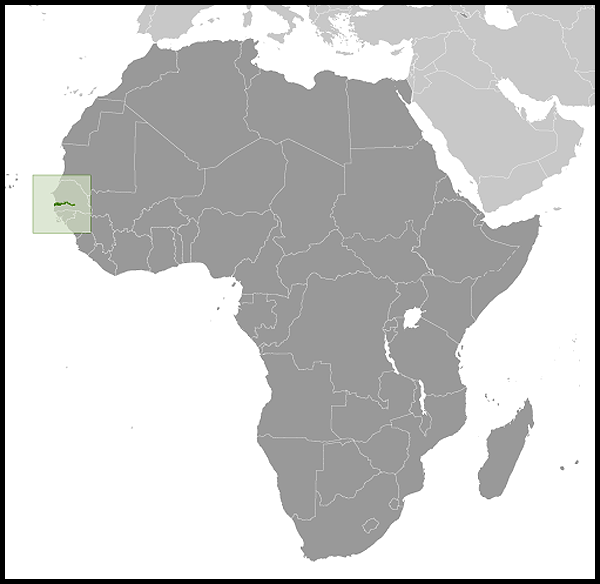 Members of the Gambian military participated in ECOMOG, the West African force deployed during the Liberian civil war beginning in 1990. Gambian forces have subsequently participated in several other peacekeeping operations, including, inter alia, Bosnia, Kosovo, Democratic Republic of the Congo, Sierra Leone, Eritrea, Timor-Leste, and Darfur. The Gambia contributed 150 troops to Liberia in 2003 as part of the ECOMIL contingent. In 2004, The Gambia contributed a 196-man contingent to the UN Peacekeeping Mission in Darfur, Sudan. As of August 2010, The Gambia was contributing 2,156 peacekeepers to seven UN missions (including UNAMID in Darfur, UNMIT in Timor-Leste, UNMIS in Sudan, UNMIL in Liberia, UNOCI in Cote d'Ivoire, and MINURCAT in Central African Republic). Responsibilities for internal security and law enforcement rest with the Gambian police under the Inspector General of Police and the Minister of the Interior. Before the coup d'etat in July 1994, The Gambia was one of the oldest existing multi-party democracies in Africa. It had conducted freely contested elections every 5 years since independence. After the military coup, politicians from deposed President Jawara's People's Progressive Party (PPP) and other senior government officials were banned from participating in politics until July 2001. President Jammeh won the September 2006 elections with 67% of the vote while the opposition alliance won a total of 27%. In the January 2007 parliamentary elections, Jammeh's APRC won 42 of the available 48 seats. While both the September and January elections were declared credible, several sources reported increased oversight of journalists in the preceding months. A failed coup in March 2006 had a major effect on The Gambia's political climate. Since then President Jammeh has taken far-reaching steps to maintain power. The next presidential elections will be held on November 24, 2011, and parliamentary elections on March 24, 2012. Agriculture accounts for roughly 24% of gross domestic product (GDP) and employs about 70% of the labor force. Within agriculture, peanut production accounts for 6.9% of GDP, other crops 8.3%, livestock 5.3%, fishing 4%, and forestry 0.5%. Industry accounts for approximately 12% of GDP and services about 59%. The limited amount of manufacturing is primarily agricultural-based (e.g., peanut processing, bakeries, a brewery, and a tannery). Other manufacturing activities include soap, soft drinks, and clothing. 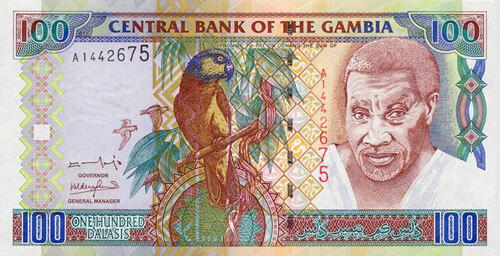 The Gambia followed a formal policy of nonalignment throughout most of former President Jawara's tenure. It maintained close relations with the United Kingdom, Senegal, and other African countries. The July 1994 coup strained The Gambia's relationship with Western powers, particularly the United States, which until 2002 suspended most non-humanitarian assistance in accordance with Section 508 of the Foreign Assistance Act. Beginning in 1995, President Jammeh established diplomatic relations with several additional countries, including Libya, Taiwan, and Cuba. U.S. policy seeks to build improved relations with The Gambia on the basis of historical ties, mutual respect, democratic rule, human rights, and adherence to UN resolutions on counterterrorism, conflict diamonds, and other forms of trafficking. Following The Gambia's successful presidential and legislative elections in October 2001 and January 2002, respectively, the U.S. Government determined that a democratically elected government had assumed office and thus lifted the sanctions it had imposed against The Gambia in accordance with Section 508 of the Foreign Assistance Act as a result of the 1994 coup. U.S. assistance supports democracy, human rights, girls' education, and the fight against HIV/AIDS. In addition, the Peace Corps (http://www.peacecorps.gov/) maintains a large program with about 100 volunteers engaged in the environment, public health, and education sectors, mainly at the village level. Relations with the U.S. have not improved significantly due to the human rights and freedom of press shortcomings, which resulted in the suspension of The Gambia's compact with the Millennium Challenge Corporation (MCC) in June 2006. The Gambia became eligible for preferential trade benefits under the African Growth and Opportunity Act (AGOA) on January 1, 2003. As of 2009, the United States exported $7 million of goods to The Gambia and imported $600,000 of goods. The U.S. Embassy (http://banjul.usembassy.gov/) in The Gambia is situated in Fajara on Kairaba Avenue, formerly known as Pipeline Road. Tel:  4392856; fax  4392475). The Peace Corps office also is on Kairaba Avenue near the embassy. (Tel. 4392466). The international mailing address for the embassy is American Embassy, PMB 19, Kairaba Avenue, Banjul, The Gambia.